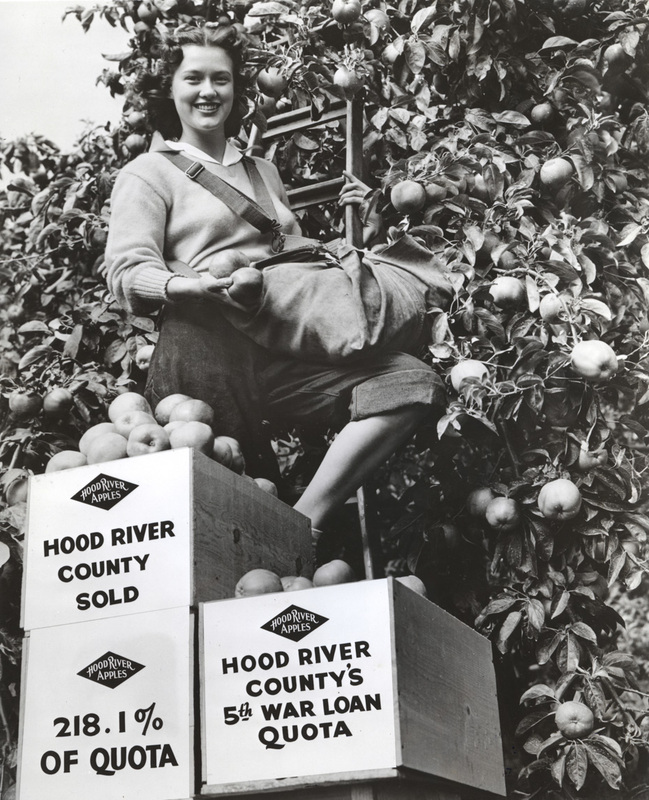 Miss Ada Vee Webster, daughter of Roy Webster, Hood River Fruit Grower, in Ed Lage Orchard after Fifth War Loan Campaign. I chuckled when I saw this. During this latest hot weather, I rolled up my jeans, similar to Miss Ada's. I didn't know it was unusual looking until my husband said, "Wow, I haven't seen that look since the 1950's"
Maybe if I had looked like Miss Ada, he would have been more impressed. For you HR apple growers.....any guess on what kind of apple? Lovely young lady, great composition. So people bought war bonds, loaning money to the govt for war purposes. Were these bonds then cashed back in after the war? Anystipulations? A lot of those bonds ended up sitting the drawers for years or decades after their maturity date. They would still earn some interest, but it was variable and not necessarily as much as the original interest. and as I have noted before, the bond sales booth originally located outside the Butler Bank building was on our Belmont place as the irrigation pump house...last I looked it was still there. Many celebrities participated in various ways throughout the war. Many went overseas to entertain the troops, while many went on what was called "The War Bond Drive." One of those was the boxer Jack Dempsey, who came to Hood River on a "Bond Drive." Yes, Arlen it was located outside the Butler Bank, with speeches getting the crowd in the mood to buy. I don't recall the event, but my Dad took me and bought me a bond from Jack Dempsey. He always told me about he wished he had a photo of Jack Dempsey shaking my little tiny hand in his huge one.